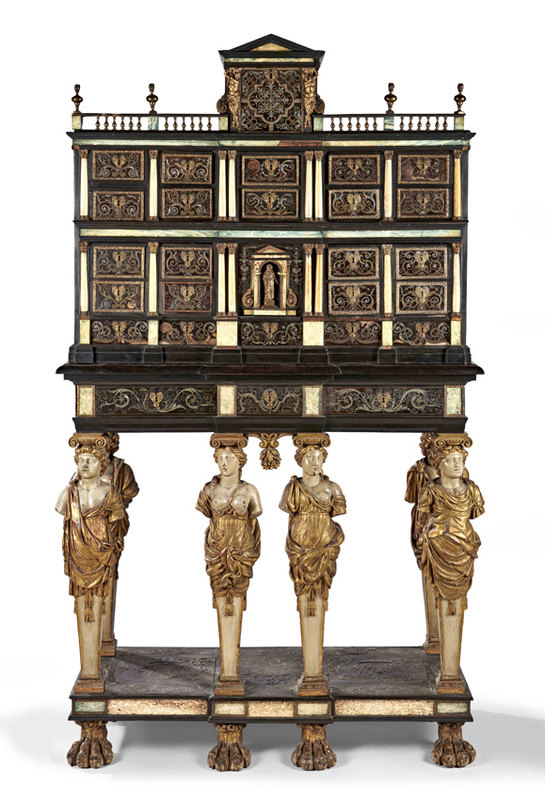 A 17th century architectural cabinet attributed to Pierre Gole that sold for a hammer price of €790,000 (£675,215) at Pescheteau-Badin. Image copyright: Pescheteau-Badin/Drouot. The elaborate 6ft (1.8m) high and 3ft 6in (1m) wide cabinet is of classic architectural format with an arrangement of 24 drawers and a small central door opening to reveal a columned and niched recess, while the pewter-inlaid sides feature a crowned monogram. It is set on a painted and gilt stand with supports formed as male and female terms united by a platform that is also monogrammed. The cabinet has been attributed to the 17th century ébéniste Piere Gole on the basis of its resemblance to other similar Gole examples notably an ivory, marquetry and painted wood cabinet now in the Victoria & Albert Museum. Estimated at €100,000-150,000, Peschetau-Badin’s piece was hammered down to a French collector for €790,000 (£675,215) thereby accounting for a substantial slice of the overall total. The sale also included a rare early plaster model by Auguste Rodin of a caryatid holding a sphere which was signed by the sculptor with a dedication, à mon ami Feyen-Perrin. Created in 1886, the 16in (40cm) high plaster was given to the artist Feyen-Perrin by Rodin. It sold for €220,000 (£188,035) around three times the estimate.